»Up Your Travel Game With Mayapur In Bengal! Up Your Travel Game With Mayapur In Bengal! Are you awaiting your next trip eagerly but are confused as to traverse which thrilling paradise this time? If the melodious chime of bells or the conch shells mesmerizes you, then Mayapur it is. If the wilderness of the flowers or the birds singing harmonious tunes during sunrise makes you skip a beat and you admire a divine culture and a dip of the Ganges water shall make your day, then Mayapur should be on your itinerary. Fond of spiritual tourism? Let Mayapur calm your soul down. You can rejuvenate and stay away from the cacophony of the crazy crowds. Go for a boat ride in the Ganges or enjoy a beautiful sunset by the river, only in Mayapur of Bengal. Let us delve deeper into the magical land of Mayapur. It is referred to as the land of golden avatar - Sri Chaitanya Mahaprabhu, who commenced as another form of Shri Krishna, some 500 years ago. He is the one who began the Krishna Movement. With nine islands in its vicinity, Mayapur resides on the island named Antardvip. This is a stunning place covered by gorgeous green paddy and the river Ganges. Mayapur came into being in the year 1970 when Bhaktivedanta Swami Prabhupada laid down the blueprint for this spiritual town. This was for the well-being of the people and also in order to inculcate an amazing spiritual culture and education and to make plenty of people participate in the Krishna Consciousness. 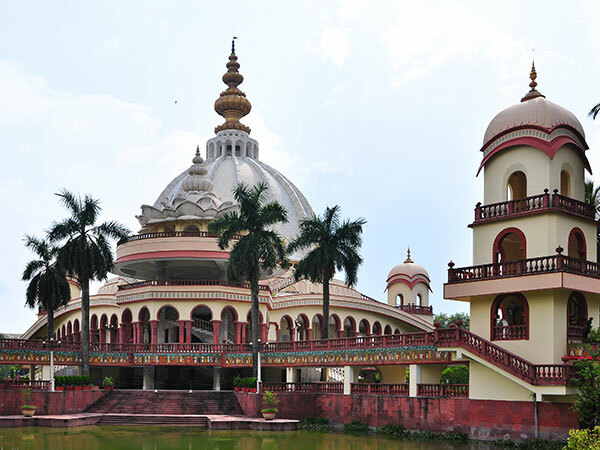 Not to forget the ISKCON Mayapur campus which is a brilliant oasis with huge acres of land. Its marvellous architecture has crossed the limits of excellence quite a number of times; the longest building being present in Kolkata and Asia being the possessor of the largest dome and kudos to the upcoming largest temple in the world, namely the Temple of Vedic Planetarium. You will not believe that it is more than 350 feet high and was successfully completed in the year 2016, which was commemorated as the 50th anniversary of ISKCON. The project comprises a temple hall which can hold 5000 devotees plus a Vedic planetarium where the universe is deemed and sized according to the norms of the Vedic cosmology. By Air: The closest airport shall definitely be Netaji Subhash Chandra Bose International Airport which is in Kolkata. It is some 117 km away from Mayapur. You can catch a cab from there. By Rail: You could catch a train from Howrah Junction Railway Station. It shall cross through Nabadwip Dham and from its railway station, taxi services can be availed to reach Mayapur. It is around 30 km away. By Road: Its excellent network of roadways, joins it to various parts of Bengal. The closest bus stop to Mayapur will be at Krishnanagar. It is at a distance of 20 km from Mayapur. You shall find cabs from various parts of Bengal in order to reach Mayapur. Nevertheless, you shall find rickshaws, autos and even boats to cross the river. Being the famous place Mayapur is, devotees hum around the place all year round. But, if you still want to make an appearance at the best time, it has to be the time of frost between November and February, when the temperature is pleasant. You shall love being there during the monsoons too when the showers shall greet you with a bout of happy vibes. Avoid the summers as the temperature might swoop up to 30 degrees. This temple area is beautiful and green and has numerous places for worshipping purpose. All the significant deities are present in the temple and these spectacular idols captivate the interest of one and all. You shall catch a glimpse of the main temple as well as the founder of ISKCON. Do you know who it is? Acharya Srila Prabhupada. Also, the idols of Sri Sri Radha Madhava and of Lord Nrisimhadeva find their way to the very centre of the temple compound. But the best part of the temple is Srila Prabhupada's Pushpa Samadhi Mandir or the shrine of Srila Prabhupada. It is a glistening marble dome which glows when the soft rays of the Sun wave a wand over it. People are also crazy about the Govinda restaurant which serves the most delicious, mouth-watering food: a speciality of all ISKCON temples. The Divine is said to possess healing powers and so coming here, shall only be for your betterment. You should definitely not miss out on this pristine white marble tower, which is some 30 m high and is also deemed to be the birthplace of Chaitanya Mahaprabhu. What is the Yoga Peeth famous for? It is a centre which we know shall teach you Yoga, Vedas and meditation skills extremely well. It shall amuse you to know that Chaitanya was born below a Neem tree. You can still spot it in the vicinity of Yoga Peeth. Here, you shall also come across a hut which comprises clay models and statues which shall explain to you the life and philosophies of the Saint. A small shrine is also located nearby which goes by the name of Srila Bhaktivinoda Thakur. Can you guess who this math is dedicated to? It is dedicated to Radha Govinda and comprises four altars devoted to the Vaishnava acharyas namely Sri Madhavacharya, Sri Ramanujacharya, Sri Vishnuswami and Sri Nimbarka. The founder credits shall go to the Acharya of the Gaudiya Math, namely Srila Bhaktisiddhanta Sarasvati Maharaja. Chand Kazi was recognized as the magistrate of Nabadwip who went against the Harinam Sankirtana movement in Mayapur and destroyed the mridanga of Srivash Pandit, who was the leader of the Sankritana. He believed in the Islam religion. This Samadhi stands strong to celebrate his turning into a faithful follower of Shree Chaitanya Prabhu. In the mood for some shopping? Let the Mayapur Market enliven your souls with numerous varieties of Krishna idols, trinkets, books, prayer tools as well as clothes and sweet-smelling flowers which spread their fragrance everywhere. The onlookers are filled with a vibrant energy as they rummage through souvenirs in Mayapur! Hail Mayapur! Come one! Come All!